Transport Associations president Vijay Rawal has accused the transport start-ups of non-cooperation and said firms like Rivigo and Vyom are continuing their activities. The ongoing nation-wide truckers’ strike, which entered the sixth day on Wednesday, saw transport associations accusing transport start-ups of non-cooperation. Rawal said, “These companies throughout the year are asking our members for support by taking our trucks for loads or giving their trucks to us for our loads.” “We condemn this move by these start-ups and urge our members to not support them,” added Rawal. One of the officials from the start-up accused of non-cooperation on condition of anonymity said, “When the community itself doesn’t have a consensus on the strike, how can they accuse us. First-of-all we are truck aggregators and are fleet of trucks is very small. “Secondly, those transporters who don’t want to join the chakka jam they are plying their vehicles, how can we stop them if they are registered with us and want to work.” He added that there was a lot of work-culture difference between transporters and start-ups. The indefinite strike called by All India Motor Transport Congress (AIMTC) since 20 July has led to losses of over Rs 10,000 crore till Monday. 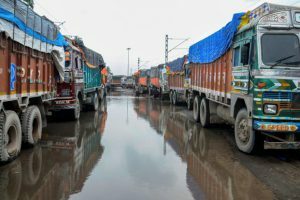 The truckers are on agitation to press for reduction in central and state taxes by getting diesel under the GST, national permits for all buses and trucks, abolition of indirect taxes and high insurance premiums. The impact of the strike has hit Maharashtra region the most.